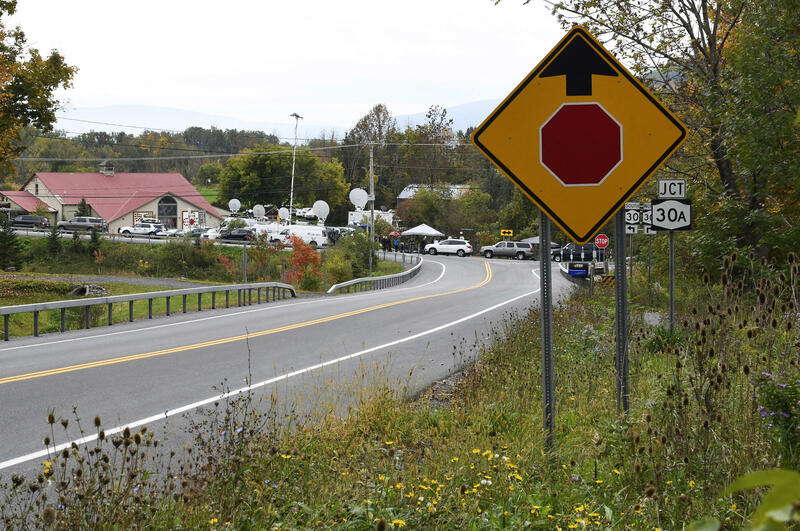 News trucks park at the site of the limousine crash that killed 20 people in Schoharie, N.Y., on Saturday. The National Transportation Safety Board is investigating the accident. As NPR reported yesterday, the 17 passengers were attending a 30th birthday celebration when the modified 2001 Ford Excursion overran a T-intersection in Schoharie, N.Y., about 40 miles west of Albany, careening into a parking lot and striking an unoccupied vehicle and two people. Speaking to reporters, Cuomo said it remains unclear whether driver error or vehicle malfunction led to the crash, which is being investigated by New York State Police and the National Transportation Safety Board. Prestige Limousine, the company that operated the vehicle, has been ordered to stop operations. "The instinct is always, 'We need a new law. We need a new regulation,' " Cuomo said. "Sometimes the issue is: 'The law worked fine, and the regulation worked fine; they were just broken.' "
But while the driver and vehicle did not comply with state regulations, the accident also raises concerns inherent to limousine safety. A stretch SUV limousine like the one involved in the accident is often created by modifying an existing vehicle — essentially sawing it in half, then lengthening the body and refurbishing the interior. "When we look at limousines and stretch limos, we see a really Frankenstein system of cars that potentially are cut up and put back together with parts and pieces that were not original to them," says Deborah Hersman, president and CEO of the nonprofit National Safety Council and former chair of the NTSB. "And additionally, some things may be taken off — things like air bags or seat belts." And these modifications can affect handling and a vehicle's ability to withstand crashes. Another complicating factor is that U.S. transportation regulation is overseen by a patchwork of federal and state agencies, and regulations can vary greatly among states. For example, Hersman says, 28 states and the District of Columbia have laws requiring seat belt use for back-seat passengers, leaving 22 states without these laws. New York authorities would not comment on whether any of the passengers killed in Saturday's accident were wearing seat belts. Under state law, the limo's driver would have been required to wear one as a front-seat passenger, while the passengers in the back would not. National Transportation Safety Board Chairman Robert Sumwalt told The Associated Press that the 19-seat vehicle had "at least some" seat belts. "We want that to be something that comes out of this crash, and the discussion that we're having at a national level, is that you've got to buckle up in the back," Hersman says. "It's critically important." States also have the bulk of the authority when it comes to regulating services for hire. The NHTSA set standards for vehicle design, and the Federal Motor Carrier Safety Administration has responsibility and oversight for commercial vehicle operations. Hersman says the federal responsibility for overseeing companies that operate in multiple states is a bit of a hodgepodge. "The bulk of the oversight for any organization that's going to be offering services for hire that are completely within a state would really fall very heavily to the state," she says. "What this crash brings home is that there is a gap in oversight when it comes to limousine operations."